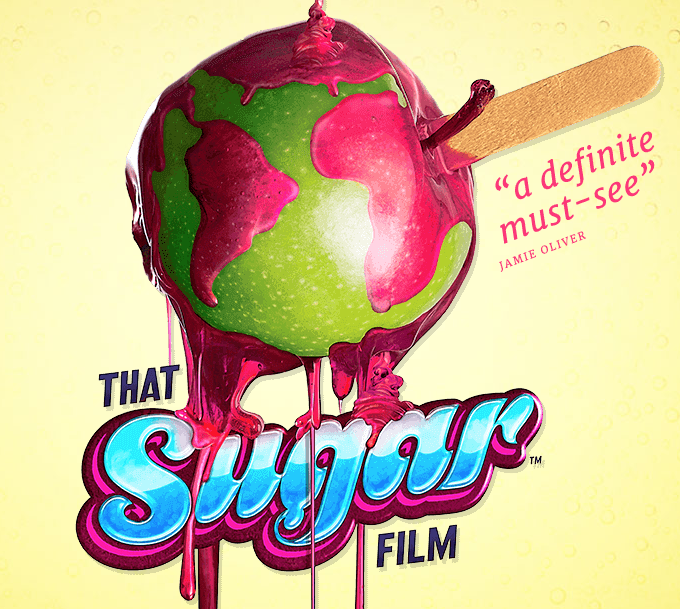 That Sugar Film is the best and most entertaining hour and 41 minute account of what sugar does to the human body available. Note there’s a companion book as well. The human body in question belongs to Australian actor Damon Gameau. Damon is an engaging, articulate guy in his 30s who directs the movie as well. As he describes it, his upbringing and early adult years involved diets high in sugar, plus some alcohol and tobacco as he got older. Then for love of a good woman, accomplished actress Zoe Tuckwell-Smith, he changed his behavior dramatically. In particular, he joined Zoe on a very good diet that compares well to what I advocate on this website, with dramatic health consequences. He also foreswore alcohol and tobacco. This started him thinking about health, and Zoe’s pregnancy focussed the thinking. He decided to conduct an experiment upon himself for 60 days, consuming a “normal” diet and recording the results, both medically and cinematographically. The results were again dramatic, albeit in a different fashion. Damon didn’t do this alone. He lined up a team of medical and nutrition professionals to help him craft the experiment and measure the results. These included noted Australian nutrition author David Gillespie, who tells Damon he’s worried about what eating the equivalent of 44 teaspoons per day of added sugar will do to Damon’s brain and body. That’s the amount of added sugar Damon and David say is how much the average Australian consumes. That works out to only 35 pounds per year, less than half American sugar consumption. The health professionals take an array of baseline measurements of Damon’s body. The experiment begins. A key piece of the experimental design is that Damon doesn’t just take the easy path and consume large quantities of obvious sugar, like soft drinks and candy. Instead, he and the nutritionist on the team pick the low fat, supposed healthy items from supermarket shelves. As discussed elsewhere on this site, the point is made that to remove the fat from food, but keep it palatable, food manufacturers must add sugar to improve the taste. The classic example of healthy food that really isn’t might be practically all yogurts. These days yogurts are make with low fat or skim milk instead of full fat milk. Some amount of sugar gets added, one way or another. The result is a sugar delivery vehicle that gets a pass even though it has a sugar per ounce content comparable to soft drinks, with identical effects. For an American, it’s really interesting to see the Australian equivalents of our popular products and brands. The comment is made that if products without added sugars were removed from supermarkets, about 80% of products would disappear. I wouldn’t be surprised if that was even higher in American supermarkets. During the experiment Damon visits the original inhabitants of Australia, the Aborigines in the town of Amata, near the fabled landmark Uluru. The people of Amata have a recent history of phenomenal sugar consumption, much of it from of a famous soft drink. The health effects have been devastating. A program named Mia Wiru had been started to change people’s behavior, but the funding was pulled by the Australian government despite striking success. Learn more at the Mia Wiru Foundation website. He then travels to the heart of sugar darkness, the United States of America. In the state of Kentucky, he illustrates a situation similar to the one in Amata, where children grow up consuming vast quantities of high sugar and caffeine soda, again with terrible consequences. One of those is teeth that are rotten and useless before adulthood, as he learns from a dentist who travels the region trying to help. Damon interviews a number of people in the U.S. He has extensive conversations with Gary Taubes and Michael Moss. I’ve talked about Gary quite a bit elsewhere, since he’s arguably the most important investigative science writer who’s shown the emperor’s lack of sugary clothing. Moss has written quite a bit about the inner workings of the food industry, documenting their techniques for creating additive products. All the conversations are interesting. The strangest interview is with a nutrition scientist who obtains his funding from the food industry. The results of the experiment are striking. Despite eating almost the same total calories per day, 2300, Damon gains kilograms of weight, mostly in his abdomen as fatty liver disease progresses, one of the key signs of metabolic syndrome. His small dense LDL, the sort associated with heart disease, increases substantially. Other health markers deteriorate, dropping him from above average for an Australian male his age, to significantly below. His mood becomes unstable–short post sugar consumption highs alternating with blood sugar and mood low spots. He comments on the stress this is causing his partner Zoe, who’s supportive throughout. Sound familiar? The good news is that after the 60 days are over, he returns to good health relatively quickly when he resumes the diet and Zoe normally consume. We learn of the birth of their daughter a few months after the experiment. The experiment will help inform their rearing of their child. Damon Gameau is a very engaging actor. Zoe too, for that matter. The supporting experts are presented well on screen. Damon makes the entire experience fun and funny, despite the bad things happening to his body and brain. He clearly has some talented cinematographic design people in his crew. The experts he wants to speak for themselves show up in sidebars and labels throughout the film. He takes journeys into the liver, the bloodstream, and the skull. There’s a closing musical number that I won’t even attempt to explain. The science described in the movie is accurate relative Damon’s acknowledged sources of information. He describes the effects of insulin that Gary Taubes writes about. He’s clearly paid attention to Dr. Robert Lustig’s writing and speaking about the real villain in the sugar family, fructose. Although he knows of the work, he decided not to discuss the underlying mechanisms that Dr. Richard Johnson’s lab is elucidating. Fortunately, that’s not relevant to the very practical message of the film. In fact, I learned of the film when Dr. Johnson recommended it to me. There are a couple of comments regarding the necessity of glucose for normal metabolism that are at odds with the evidence for ketogenic metabolism that Jeff Volek, Steve Phinney, and Tim Noakes discuss in their work. Again, it’s not relevant to the basic message. I can’t recommend this movie enough. It shows the problem of toxic diet about as directly as possible, but with charm and humor. Just as important, it shows a very clear path out of the toxic diet metabolic swamp, at least for those with the means to follow the path. 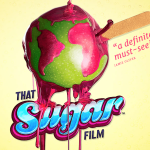 The supporting book, That Sugar Book, reprises the movie very well, with additional supporting material. Then it has a what-to-do section with an excellent set of recipes. The book is as well designed graphically as the film.